The Nevco Ezy Approach ground loading trailer specialists have added another unique and practical design feature to the range. A retractable drawbar that allows for EZY and efficient storage of your trailer. It is a clever design that offers simple and fast one-person operation to remove the drawbar and store in a vertical position. The feature was designed to maximise the space required for trailer storage when not in operation. The video below demonstrates the ease with which raising and lowering the drawbar takes place. The drawbar feature has been added to a Nevco Ezy Approach ZERO ground loading utility trailer with the added feature of a hydraulically activated rear loading ramp. 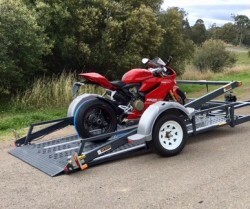 Please contact one of our trailer specialists on 02 9631 4733 to discuss your trailer requirements. This entry was posted in blog, projects. Bookmark the permalink.